A bunch of army engineers in Transylvania blast open a crypt. Inside, there are plaques on the walls inscribed with name Dracula. Rather than running away screaming, they leave a guard there and wander off to figure out what to do next. An earthquake causes two coffins to fall to the floor. The guard opens one to find a small shrouded body impaled by a stake. Again, instead of running away screaming, he yanks it out. He gets a neck full of vampire dog fangs for his kindness. This dog, Zoltan, unstakes a man from the other coffin. Via flashbacks (yes, both man and dog) we learn they are both servants of Dracula. Together they head out to find Dracula’s sole descendant who just happens to be on a camping trip with a car full of dogs. 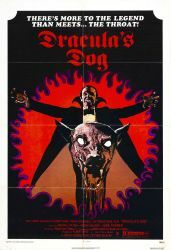 Dracula’s Dog pretty much delivers exactly what’s in the title but very little else. It wisely plays things with zero camp, because the movie threatens to collapse under its own ridiculousness at every moment. Zoltan has a plan is create a pack of vampire dogs to worm their way into heart of the man who could become the next Dracula. This is also the second movie from the 1970s to feature a dog having a flashback sequence. There’s a vampire hunter who knows what is happening, but once again we are forced to wait around while the hero finally uncovers what the audience has known for almost an hour. There are some decent dog stunts, and I’ll always give a film credit for using real animals for people to interact with. Zoltan is silly but there is still some enjoyable vampire action. It may also hold the honor for goofiest epilogue of all time.